Despite coming in just shy of 100 pages, I was surprised by how much there is in this book and how significant the subject matter is. In summary for me, it describes our identity and innate character by showing us God’s. From this, the author considers how God sees us and how we should see ourselves as a result. The book opens with a swift, relevant look at how society has tried to classify our race. Ultimately these classifications are shown to be short of the mark, reducing humanity down to something that is not more than our parts. The world views they set up don’t capture the essence of what it is to be human (for better and for worse), to have a conscience, emotions and a soul. And ultimately the author begins to consider a bigger world view, from the God who created them. It’s an engaging read as the author opens up this world view. With lots of quotes and references from other writers (which admittedly was almost too much in some places) I think it succeeds in shining light on ourselves, our character, triumphs and flaws and showing us how interdependent on each other we are. The author does well to show the spiritual side of our nature too, and ultimately succeeds, while being faithful to what the Bible teaches, in showing the importance of Jesus in understanding how we can know the creator God. There will be lots of reflections, pauses and questions that will be naturally raised when reading this. And in 100-odd pages, such questions can’t be fully discussed, but this feels like it stays true to its condensed purpose. I was left with a greater fascination of how as humans we were created to be in God’s image. And as a result a greater fascination in God’s plan for us all. I’d recommend this book to anyone who loves to get into big questions without reading a tome of philosophical material. For new Christians it will be enlightening and certainly raise other questions to ponder. As an older Christian myself, it’s a great and swift read. Note: I received a free copy of this book from the publisher in exchange for a fair review. This little book delivers on all counts. The reason being it does not just cover what I expected it to but so much more in the space of just ninety five pages. 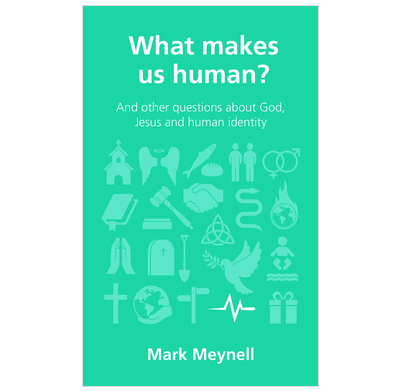 Being human is complicated and the author confronts this reality head on, whilst at the same time providing biblically sound apologetic reasons for why we cannot be defined by merely reductionist arguments. The encouragement, of course, is how we can be defined! However, the argument is smooth and does not stutter into a narrowly defined biblical argument but confidently leads us into a larger and broader understanding, of Jesus’ significance in helping us to understand what it means to be truly human. I would recommend this book to a non-Christian, a newly converted Christian and a mature Christian alike. It is a book that can happily be passed on, being in the range of little books that are both accessible and thorough at the same time. I was given this book from the Publisher in exchange for an honest review.